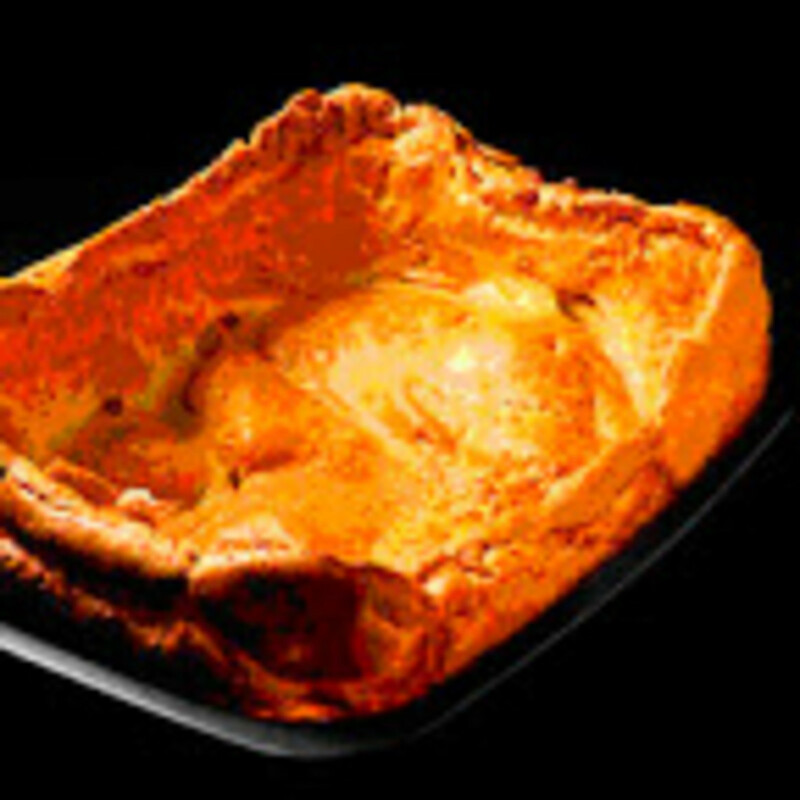 A Yorkshire Pudding Recipe is traditionally a plain batter pudding served with the savoury part of a meal. Yorkshire Pudding is not difficult to cook at home and freshly made Yorkshire Puddings are infinately better than the frozen Yorkshire puddings that you can buy from the supermarkets. All you need to make perfect Yorkshire Puddings is the right Yorkshire Pudding recipe, the right tins to cook the Yorkshire puddings in and the right temperature in the oven. So, read on and find out all about the Yorkshire Pudding, including how to make Yorkshire Pudding.. .. and how to eat those yummy Yorkies. Did Yorkshire Pudding really come from Yorkshire? Yorkshire Pudding is thought to originate, as its name suggests, from my home County of Yorkshire in the North of England. I'm told that the Yorkshire pudding recipe is similar to that of Popovers, but popovers are not meant to rise as high or be as airy as a traditional Yorkshire Pudding. 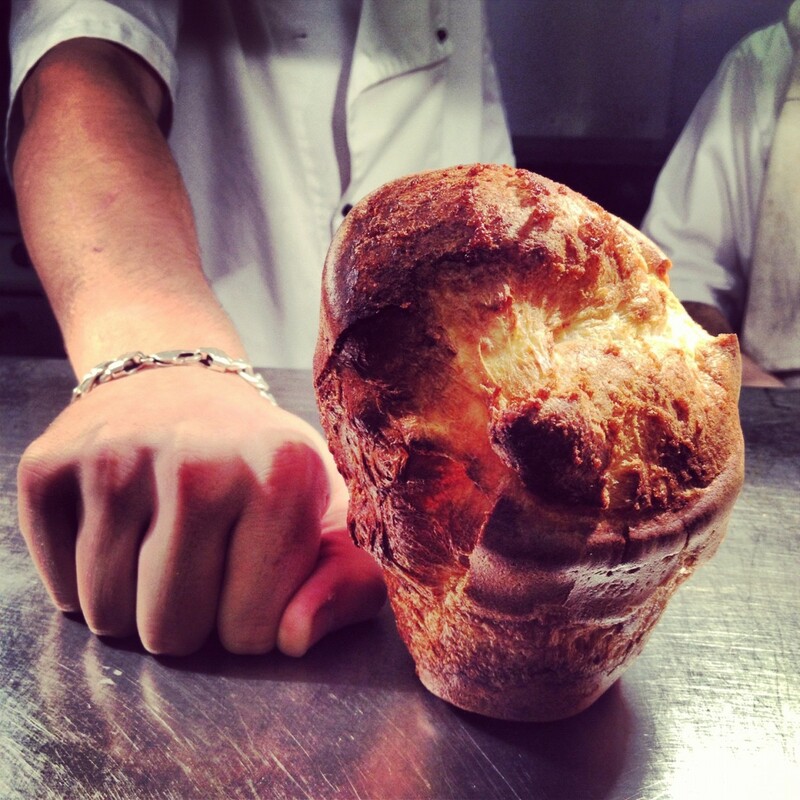 Although originating in Yorkshire, the Yorkshire pudding is popular all over the UK, indeed the world. There are few places that you can go that you will not find the legendary 'Traditional British Roast Beef and Yorkshire Pudding Sunday Roast Dinner' or indeed lunch on offer. 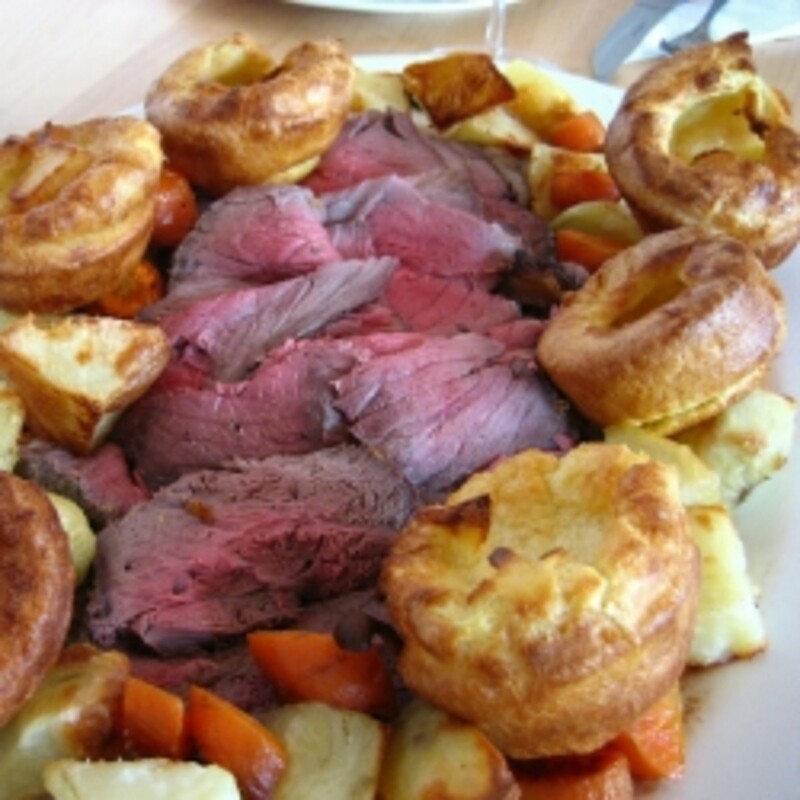 Roast beef and Yorkshire Pudding is perhaps one of the most famous of British meals, however many people in the UK eat Yorkshire pudding with any roast meat or chicken, and Yorkshire pudding has always been a firm favourite as part of the "Sunday Roast Dinner". If you don't see the answer to your Yorkshire Pudding question here please post your question in the guestbook and I will add it and the answer to the Yorkshire pudding FAQ. Can I substitute the dripping or lard when making Yorkshire pudding? Yes, I often use vegetable oil to make my Yorkshire pudding, especially if we have our vegetarian friends around for dinner. 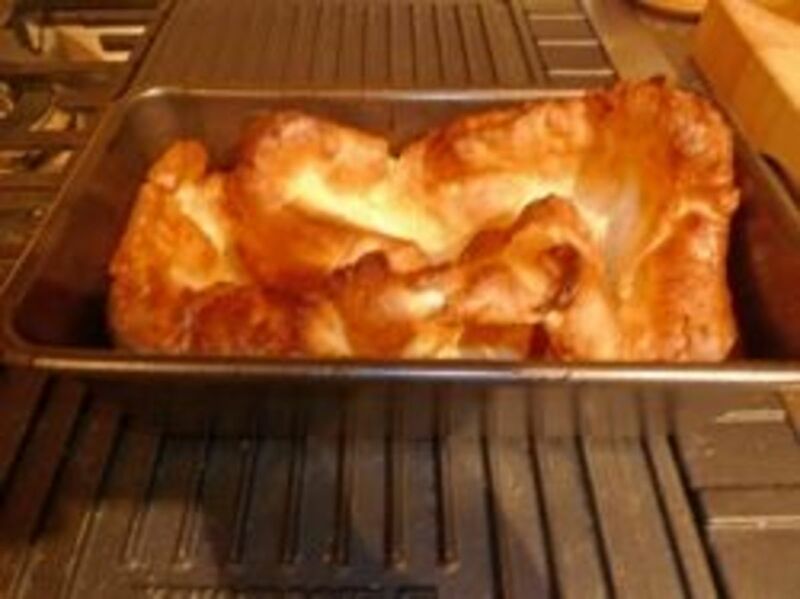 Can you use self raising flour to make Yorkshire pudding? No, your Yorkshire pudding will not rise if you make them with self raising flour. Never use self raising flour or any other raising agents when making Yorkshire Pudding. Can you make yorkshire pudding without eggs? A light, crispy, well risen Yorkshire pudding as we know it needs the eggs in the batter mix. 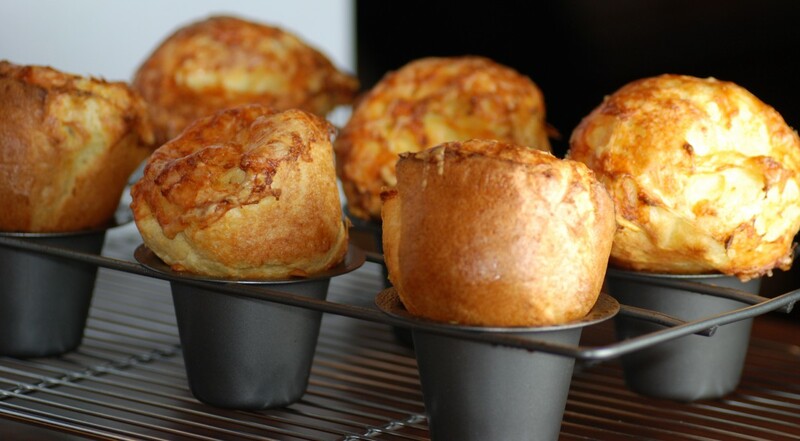 I have only come across one Yorkshire Pudding recipe using egg replacer but I haven't tried it. I would love to hear from anyone who has. What kind of pan do I need to make Yorkshire pudding? You can buy specially made Yorkshire Pudding Tins, they have cups which are more shallow and flatter than those used for baking muffins but regular muffin or loaf pans will do the job fine. You really need to buy the best tins that you can afford so that they don't buckle with the high temperatures which are needed to cook Yorkshire pudding. Amazingly it seems that Yorkshire Pudding has been around for hundreds of years, the first known Yorkshire Pud dates as far back as the 1700's when it was served as a first course with the purpose of 'filling people up', perhaps because people at the time were poor and couldn't afford much meat! Back in those days the meat was usually roasted on a spit, the Yorkshire Pudding batter was put underneath the roasting meat and the fat and meat juices dripped onto the batter. Meat was more scarce or expensive than it is today and there frequently wouldn't be enough meat to serve the whole family so the children would get Yorkshire Pudding and gravy as their main meal. These days Yorkshire Pudding is probably best known for being served with a roast beef main course to form part of a 'traditional roast beef and yorkshire pudding dinner', but here in Yorkshire we often eat Yorkshire pudding just on its own filled with onion gravy (a delicious sage and onion gravy with the Yorkshire pudding is popular in my family) so that the Yorkshire pudding itself acts as a kind of edible dish brimming with the most delicious gravy. According to celebrity chef James Martin, the perfect Yorkshire Pudding should rise to a height of around 10 cm and be nice and crisp on the outside. 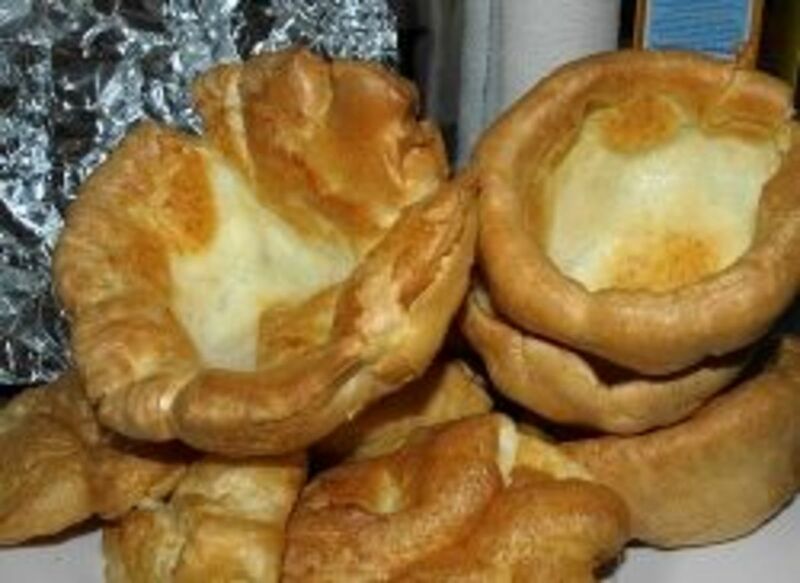 The traditional Yorkshire Pudding recipe is made from eggs, milk and plain flour, and traditionally the the fat used from cooking the roast meat would be used in the tins, but it is perfectly acceptable to use vegetable oil, especially if you need a vegetarian version of the Yorkshire pudding. The Yorkshire Pudding Tin - You really need the best quality Yorkshire Pudding tins you can afford so that they don't bucle with the high temperatures needed. If you decide that you would rather make Yorkshire pudding, rather than buy the frozen variety, you can use muffin tins for cooking the individual puddings, or you can buy special Yorkshire pudding tins that have much shallower, flatter cups in them. You need to buy the best tins that you can afford so that they don't buckle with the high temperatures needed to cook the Yorkshire pudding. What kind of fat should I use to make Traditional Yorkshire Pudding? Traditional Yorkshire Pudding is usually cooked in beef dripping, or lard, which you can buy in blocks in shops in the UK. As an alternative, oil may be used. Butter is not a good substitute for dripping as it can't stand the high heat needed to cook the Yorkshire pudding, it will burn on you. Just Google 'Yorkshire pudding recipe' and you will get thousands of results, however, I have gone with a recipe from Delia Smith, a very respected British cook who has written numerous books and made many TV programs, because I have found her recipes very easy to follow and whenever I have made one of her recipes the end result has always turned out as it should. 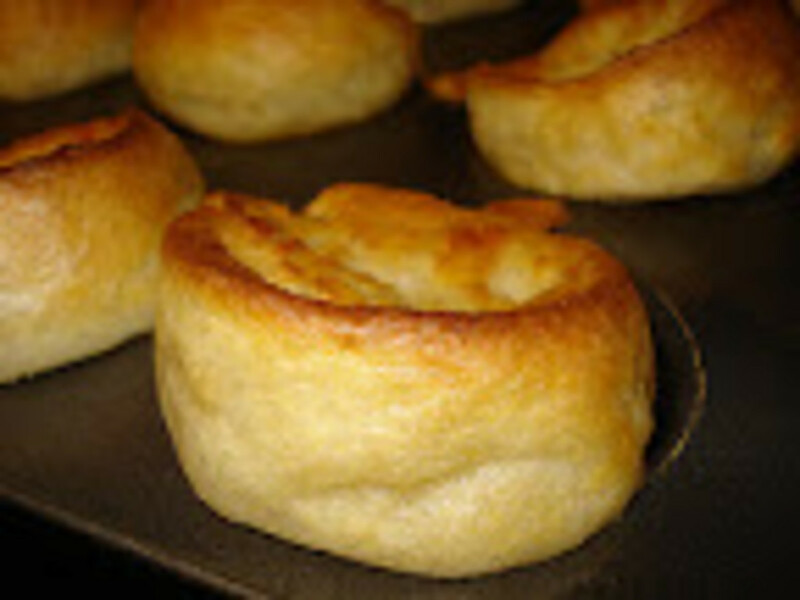 The Yorkshire Pudding recipe uses large roasting tins, which the meat was cooking in, but muffin tins can be used instead to make the smaller sized puddings. A classic Yorkshire pudding is not difficult to make provided you have the right recipe, the right size tin and the right oven temperature. I find a good solid roasting tin 11 x 7 inches (28 x 18 cm) makes a perfect pud for four people. So, for eight, I double the ingredients and use two tins. Make up the batter by sifting the flour into a bowl and making a well in the centre. Break the egg into it and beat, gradually incorporating the flour, and then beat in the milk, 2 fl oz (50 ml) water and seasoning (an electric hand whisk will do this in seconds). There is no need to leave the batter to stand, so make it when you're ready to cook the pudding. About 15 minutes before the beef is due to come out of the oven, increase the heat to gas mark 7, 425Â°F (220Â°C), add the dripping to the roasting tin and place that on a baking sheet on a free shelf. After 15 minutes remove the meat, then place the tin over direct heat while you pour the batter into the sizzling hot fat. Return the tin to the baking sheet on the highest shelf (or, if you have roast potatoes on that one, the second highest). The pudding will take 25-30 minutes to rise and become crisp and golden. Serve as soon as possible: if it has to wait around too long it loses its crunchiness. I always use an electric hand mixer when preparing the Yorkshire Pudding batter, it makes a perfect job and ensures that there are no little floury lumps left in the batter mix. Never use self-raising flour, or any kind of baking powder, it turns out flat, soggy Yorkshire pudding. Yorkshire Pudding Is Not Just Food, It's a Tradition! Many people in Yorkshire and the North of England eat eat their Yorkshire pudding before the main meal, as a starter, and regard the custom of eating Yorkshire pudding with the main meal as "odd" and think it's a southern English habit. I remember that my Grandmother used to make the most fantastic Yorkshire pudding. Her recipe for yorkshire pudding was in her head, she never measured ingredients, just seemed to have a sense of the right amounts. Her Yorkshire pudding always turned out just right, perfectly risen, crispy around the edges and leaving a hollow to collect the gravy in and always that lovely golden colour that we associate with Yorkshire puddings. If she was alive today I believe she would be horrified that you can now buy ready made yorkshire pudding mix for the batter, or frozen, fully-cooked individual Yorkshire pudding that just needs re-heating. I have to say that the 'convenience' Yorkshire puddings are not nearly as good as the 'real thing'especially my Grandmothers' which were cooked in the range at the side of the coal fire while the vegetables cooked in a pan on top of the coals... we have it too easy these days. Rather surprisingly my Grandmother would also serve Yorkshire pudding when it had gone cold, after the meal. The leftover Yorkshire Pudding was sometimes served as a dessert, with milk and sugar, jam or treacle. You Can Make Vegetarian Yorkshire Pudding! To make your Yorkshire pudding recipe suitable for vegetarians substitute the beef dripping for vegetable oil! The predecessor of Yorkshire Pudding, the dripping or batter pudding, has been cooked for centuries in Britain although originally they were flatter than today's well risen Yorkshire puddings. The first known Yorkshire pudding recipe was published in 1737 in 'The Whole Duty Of A Woman' and named 'A Dripping Pudding'. Eight years later a lady named Hannah Glasse published it in her Art of Cookery as Yorkshire Pudding. Traditionally Yorkshire pudding was a filler dish served with onion gravy before the main roast course in households that could not afford a lot of meat. A popular addition to menus in recent years in restaurants, cafes and bars is a king size or giant Yorkshire pudding filled with onion gravy or different meat, vegetable and gravy concoctions. 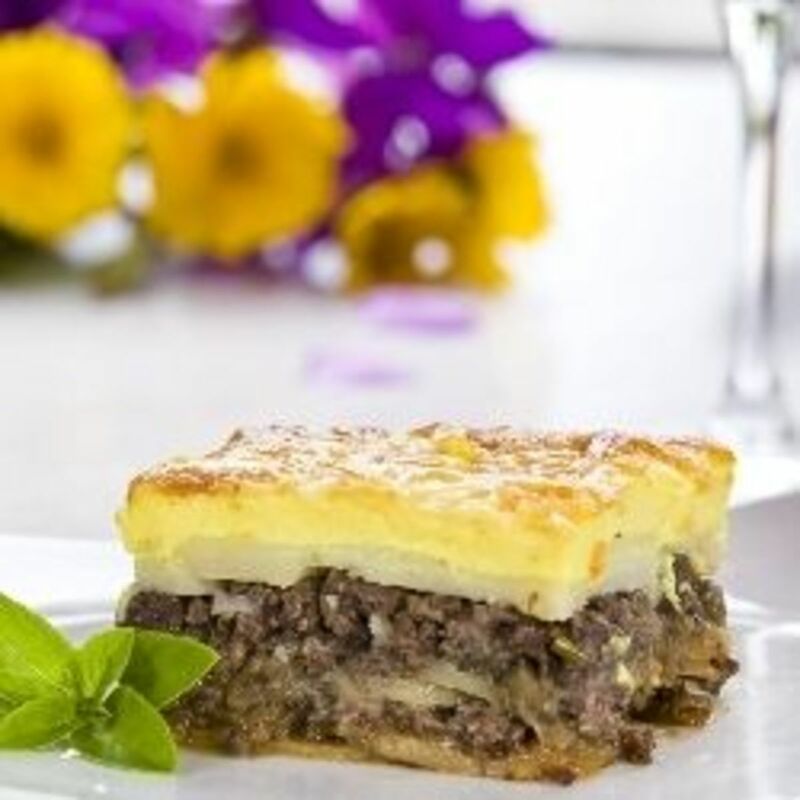 This dish is served as a separate course emulating the original filler course. Yorkshire pudding can be cooked in a large flat tray, and cut into slices, which is called a bed of Yorkshire pudding, otherwise they can be served as small individual bun-sized puddings. Either way, the perfect Yorkshire pudding has a big dip in the middle, where the gravy is poured in, and the edges rise up around the edge of the dish into a crisp crust. What Was The Biggest Yorkshire Pudding? In 1996, the Yorkshire Pudding found its way into the record books when the members of the Skipton Round Table made a Yorkshire pudding with an area of 46.46 square metres (500 sq ft). 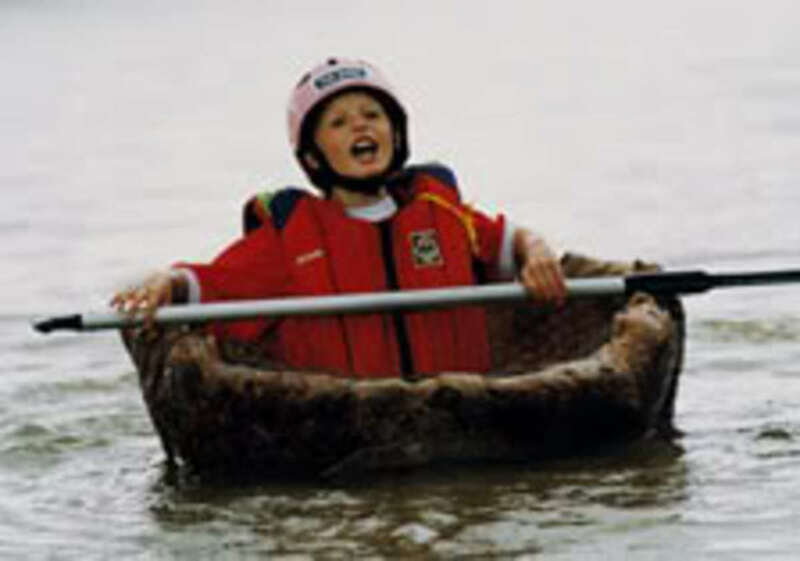 On Sunday 11th June 2000 the first Great Yorkshire Pudding Boat Race was held in Brawby in North Yorkshire. The organiser Simon Thackray arranged for 6 three foot in diameter Yorkshire puddings to be baked coated with yacht varnish. Each Yorkshire pudding 'boat' used up 50 eggs." You can never trust a news story with a formula in it ... or can you? Harrods has launched a new range of ice creams with 'traditional' British flavours including Yorkshire pudding and Arbroath smokies. The first British Yorkshire Pudding day was on February 3rd 2008 and in future the celebrations will be on the first Sunday of every February. How To Make The Best Baked Potato With Yummy Toppings And Fillings! Shepherds Pie - The Ultimate Comfort Food? Baked potato wedges don't have to be plain, here you will find ideas for a variety of flavourings to make your potato wedges zing. I'm not the greatest lover of desserts but sticky toffee pudding, served with either hot custard or cold ice cream is one I wouldn't say no to! I love homemade horseradish sauce, the flavor is so much nicer than the ready made horseradish sauce you can buy. My creamy horseradish sauce recipe is quick and easy to make and is full of flavour too! We always have them as a starter. My Gran used to cook the Yorkshires under the meat so that the fat dripped into it as they both cooked. This stemmed back to a time when meat was expensive and the Yorky pud was the main meal, not just an extra. Any left overs were always served with treacle. I'd heard the name but never knew what Yorkshire Pudding was until today. 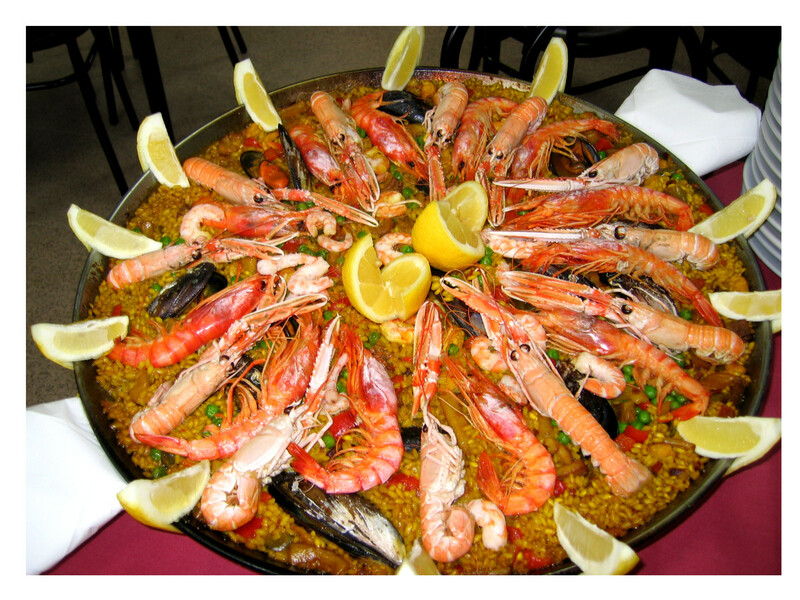 Lots of sites tell how to make them but yours is the only one that tells how to EAT them! Sounds great. I'm making some tomorrow night, for sure! As a Yorkshireman I'm unsure about Yorkshire Pudding as a dessert but may have to give it a go next time I'm entertaining. Interesting - I never knew what Yorkshire Pudding was. I discovered a new way of eating Yorkshire puds one day when i was desperate for a snack and didn't have much in. I found an 'emergency' supply in the freezer, you know, the ready-made ones that only take a few minutes to cook. I grated some cheddar cheese on top of them and put them in the oven. Delicious! You know, I've never tried Yorkshire Pudding. I'll try it now. Thanks! I'm not sure this is a dish for my family, but I love the way the lens captures my attention in a variety of ways. 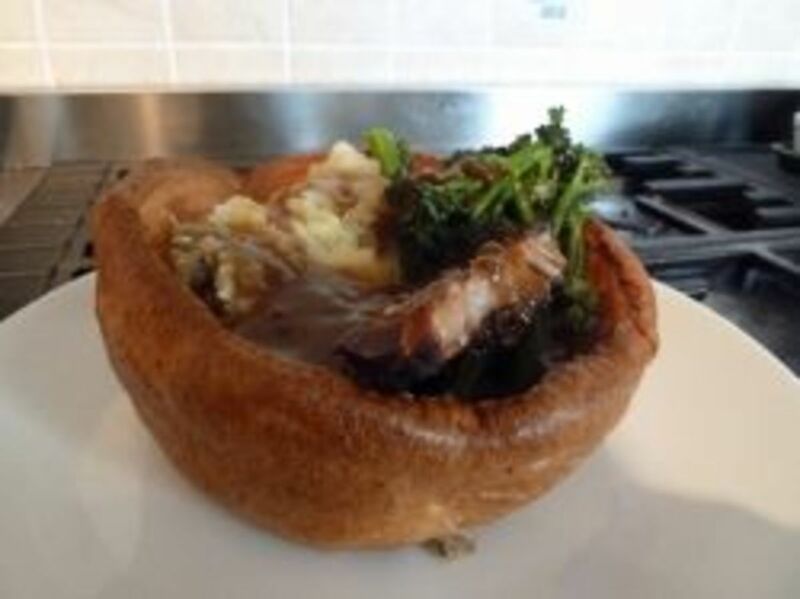 @BritFlorida: Ah now that would be how my mother likes to eat her yorkshire puddings... and with sage and onion gravy! The ONLY way to eat Yorkshire pudding is before the main meal. Furthermore, if you're male, you get one large pudding. For girls, you get three or four small ones. That's how it was in our house, anyway! I absolutely LOVE Yorkshire pudding. My mother-in-law, before her passing, made the best Yorkshire pudding I'd ever had. Those English roots, I guess. Her roast and Yorkshire Pudding was a classic holiday dish and it was no contest on whose house we frequented for dinner when that was on the menu. Wow, so much info about Yorkshire pudding, had no idea... my mom always makes it for Christmas dinner with our prime rib, but I'm the host this year so am very glad I stumbled onto your page, thanks! Any pastry that has dual purpose of being edible and containing meat, stew or vegetables....like Yorkshire pudding.. is a win-win! Great lens. so a pudding isn't something that you mix with milk and has Bill Cosby eating it with his great grand kids..... just kidding!!! As a child, in the southwest of England, Yorkshire Pudding was always served with roast beef, usually on Sunday and was a special treat, although we also had it with "Toad-in-the-Hole" (i.e. sausages in batter) Now it has become popular in London pubs, as an option, with all roast meals (I suppose they have to make Yorkshire Pudding anyway for those having the beef, so why not serve it with everything) Delicious! Love, love, love Yorkshire Pudding anytime. The only thing more eye opening than discovering new/strange/interesting facts or customs from round the world, is realising the things you take for granted may in fact be little known in other parts of the world. To me the idea of a roast dinner WITHOUT yorkshires seems absurd! Mind you never had them as a sweet dessert, always have mine covered in gravy (except for some reason when it's toad-in-the-hole, always eaten that dry). Coming from this side of the pond, I remember my first trip to England, and seeing Yorkshire pudding, I was expecting the sweet dessert pudding that most Yanks associate with the term "pudding." But once I had it, I loved it. What a great lens! I've yet to find a good Yorkshire Pudding locally, will have to try making my own now :) and dessert puddings are a fascinating idea, too! I like the idea of a Yorkshire pudding with raspberry sauce. Never had it, but it sounds delightful. I loved reading this lens, as my husband lived in England and loves Yorshire Pudding, but could never really explain to me what it was. I will have to try makings these sometime. He always ate it with gravy. I do like Yorkshire Pudding but we rarely have a full roast dinner these days such is the trend, we used to have it with gravy which I thought was the norm everywhere until I met a girl from Birmingham many many years ago. When I visited her family. We had it with jam as a dessert. Bizarre! I would use it for every course--I love Yorkshire pudding! I've never made it, but had really good ones at restaurant that served it with Prime Rib Beef. I am inspired to make it now. In your history paragraph is that supposed to be "pudding", because it says pud... wasn't sure if that was a typo/error or intentional. My first time reading/hearing about these, and I am a 3rd generation American of English descent. @mojoCNYartist: No it's not a typo... we often call them Yorkshire puds here in Yorkshire, it's just short for pudding that's all... but thanks for taking the time to point it out. Never had home made ones, but love yorkshire pudding. Often just cook them and eat them on their own. Don't see it as a desert, much like you wouldn't think black pudding to be a desert. A Yorkshire pudding is great with veg, roast potatoes and gravy. I don't eat meat but I love serving them with cauliflower cheese. Not for me but I know a lot of people that like eating them cold with jam. My mum used to cook my dad a yorkshire every evening when he returned from work. He would eat it before the main meal. On sundays he would eat it with the meal with the rest of the family. Toad in the hole is a good way to make a yorkshire a meal. Partly cook sausages in a baking tin and then add the yorkshire mixture to the tin.Bake it for about half an hour. You can also make a veggie meal with the mixture . Olive oil works best here. Get the oil smoking hot and put in vegetables which do not give out too much water such as onions , peppers, and then add the batter. At all cost - Never buy pre-cooked yorkshires! As an American it shouldn't come as a shock that my idea of pudding is chocolate and says J-E-L-L-O on the packaging. I've never had Yorkshire pudding, but it looks and sounds delicious. I will definitely be giving it a try. Great lense! I like Yorkshire puddings as part or the main meal! I'm going to try make them soon! Haven't had a pudding, but I love popovers! And this sounds very much like it! I have never had Yorkshire Pudding, would like to try it though. The video was great. Thanks. Thanks for sharing this! I love Yorkshire puddings and I would love to see them become mainstream menu items at restaurants and cafes here in North America. A sweet Yorkshire with cinnamon sugar, honey or maple syrup would go perfectly with a latte or espresso in a trendy cafe! Yum! Yummy lens. I've never tried yorkshire pudding before, but I'm all out to give it a shot. Great Lens...thanks for sharing and blessed! Nice lens! I didn't know anything about the Yorkshire Pudding, but it looks yummy! So..... it's not a pudding? LOL I had no idea. I should try one out some time. One of the most delicious meals ever!!! Prime Rib with Yorkshire Pudding!!!! Blessed! My Nana used to make her Yorkshire puddings in the roasting tin and serve the beef, gravy and veges on top of it. 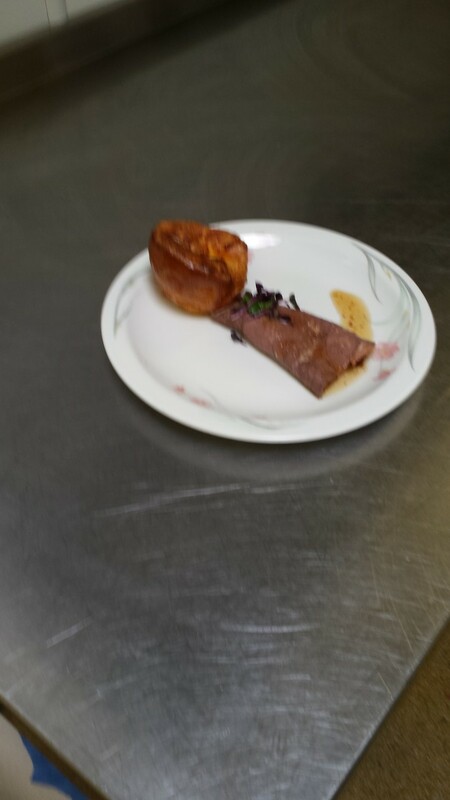 Yorkshire pudding and roast beef was always one of my favourites! I've only eaten them once, but I don't think they were that great. My step-mom, who LOVES Yorkshire pudding, said they were only so-so, herself. I'd love to experience a good one! Yorkshire pudding looks so delicious. Great lens, makes me want to run out at get some now. I'm glad I stumbled upon your lens. I never really knew what Yorkshire pudding was. It looks and sounds delicious! At the first opportunity I will try some. I have had Sheppard's Pie in a lot of different restaurants and I like it a lot. Thanks for the lens. I never even knew what Yorkshire pudding was or how it was made. Thank you, it looks really good. Nice lens!! Yorkshire Puddings have been a favourite of mine ever since I was a kid. Every birthday that's what I wanted for my birthday dinner. No matter how much dinner I had, there was always lots of room for Yorkshire puddings. I loved to pour gravy inside them. Thanks for the trip down memory lane! Even though some of our immediate family is from Yorkshire, I don't think I've had Yorkshire pudding. It sure looks good, though! I always thought Yorkshire Puddings were actual dessert puddings. I didn't find out until I actually had it brought out on a plate that it was a sort of fried batter. Except for the beef drippings sounds and looks just like popovers to me -- and mine do come just as high. I'll try this recipe and see how they compare in a taste test. In the meantime, here's some angel dust to sprinkle on your puddings. (This page is also now featured on "Wing-ing it on Squidoo," a tribute to some of the best lenses I've found since donning my wings. Cheerio! I usually just but a bit of gravy on 'em. Tasty stuff. Great lens! Blessed by a SquidAngel! It's gotta be befores, a giant one cut up between us all, and smothered in blackberry vinegar........ means more washing up, but hey, it's worth it!!!!!!!!! My mum's are to die for, with that soggy bit in the middle yuuuuuuuuuummmmmmmyyyyy!!! This Lens = The YP Encyclopedia. Thanks, I have never eaten Yorkshire Pudding. Yorkshire pud floating in gravy, mushy peas on the side: now that's heaven on a dinner plate! Loved this dish as a kid, but have been vegetarian for more than 15 years. I had not thought of trying this, so will have to give it a go. Yorkshire heaven! Eaten on their own with lashings of onion gravy. oops .. I got so carried away with reading this lens that I forgot to tell you that this is a return visit . so that I could bless it. Blessings from this forgetful aging angel. Yorkshire pudding is a favorite of our family. I serve it with the main meal. There are never leftovers to have for dessert. I used to watch Delia Smith when she had a show of her own on TV and have tried some of her recipes. This one reads "good." Blessings. My mother-in-law always made Yorkshire pudding with her roast beef dinner. Yummy memories. I never got the recipe from her, so I should try the one you have to see if it is close to that remembered goodness. Now I'm craving my mom's Yorkshire pudding! I'm now lusting for a Yorkshire Pud! As an ex-Lancashire lass (now living in Ireland) we didn't have Yorkshire puds too often, but probably because of that they were all the more delicious when one finally came to the table! Great lens - we always have yorkshire puddings with roast beef. Lensrolled to my "traditional" lenses aboyt Pantomime &amp; Christmas. 5 puddings - oops I mean stars! I have never tried to make yorkshire pudding. But you make it seem so easy,... I will have to try! mmmmmmm Now all I can do is think about yorkshire pudding!!!! Thank you for this delectable lens! I loved it when my mother made it, I have only tied to make it once, however it did not rise and turned into "York-Hockey-Pucks". I will give it a try again because your your lens! Thank-you for sharing knowledge! we love it with a really over cooked roast with some great gravy or bbq sauce and then use them to soak up all the delicious juices!!! My sister and I used to fight over the scrapings in the pan. Mom used to make it with roast beef..Thank you for this wonderful and delicious lens. So much information here. Now I am hungry! I love Yorkshire pudding!!! thanks for all the information, you don't need to be a born Brit to love it, it is fantastic and the perfect mate of roast beef! Growing up, we always had roast beef and Yorkshire pudding for Christmas dinner. My mother's family was from Mexico, but she got a James Beard cookbook for Christmas the first year she was married and always used his recipe. Maybe my father requested it because his family had English origins. Not sure, and they're both gone now so I can't ask. I just know we all loved it! I still make it. Love your lens! Thanks! Great lens! I always make extra as they're a great snack for later. I toss raisins in my batter though so they're not quite so plain. It's not a Sunday Roast without Yorkshire Puds! Absolutely love them. Have eaten them as a meal on their own before. Lovely. I could, would and have made a meal out of Yorkshire pudding alone. I LOVE the stuff. My grew up on Yorkshire pudding. My grandmother and mother made it the traditional way. They came to America from Newcastle Upon Tyne. Now I'm drooling. Yorkshire pudding means something mysterious because I've never been to England and I barely understand it. Your lens gives me, a beginner, little confidence to proceed. Yet your recipes are fairly simple and your descriptions mouth-watering. I love the English! I LOVE yorkshire pudding!!!!! YUMMY!!!!!!!!! Even though I'm from Lancashire I have to say your Yorkshire pudding lens is excellent! Blessed by your regional foods angel and added to the best regional foods lens. I haven't had Yorkshire for a few weeks, and that was when we last had Roast Beef. Sunday Roast wouldn't be the same without it. **Blessed** and featured on My Time as a Squid Angel. We are having Yorkshires tonight with sausages ! I enjoy Torkshire Puddings but the recipe I have in Canada is more like a pastry. I love both of them and they are both great with gravy. I'm from Lancashire, so tend to give Yorkshite pudding a miss! ( only joking) Love your lens. I love yorkshire puds and have only ever made them once but it was so satisfying! I really like the idea of making some sweet versions so I think I'm going to have to give it a go!! Great lens! I really like the fact that you included many variations on the pud for different diets, very thoughtful! I will try to make my own. I remember having it years ago at my friends house, but never knew how to make it.